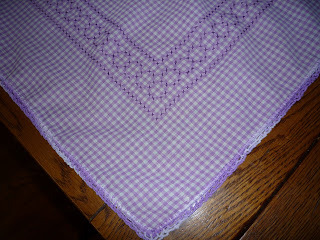 This luncheon cloth is the last find from my treasure hunt at the thrift store last week. 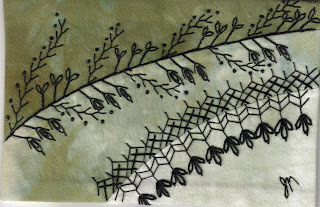 I have to confess I have a special weakness for chicken scratch embroidery, also known as snowflake embroidery. With very simple stitches gingham is transformed in a most charming way. This piece struck me as special because the gingham check is much smaller than most of the pieces I have. There is a lot of work here - if you click on the picture to enlarge it you will see the number of stitches involved. 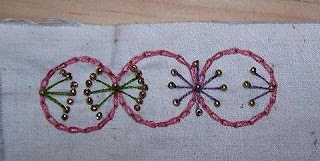 I have also included closer pictures of the border design as well as the center motif. 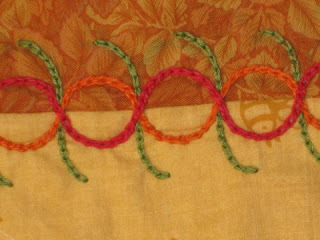 The edging is crocheted with a varigated crochet thread. I have been working on a block of Hideko's as a "round robin angel". 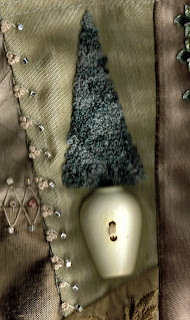 The angels stitch on blocks to replace lost ones or to fill in where others have had to drop out. This block was from a favourite book round robin - the book Hideko based her block on was "Lark Rising", and in particular the chapter on a May Day celebration. I hate to admit defeat but this block was difficult for me. I knew what I wanted to create - a SRE May Day bower as described in the book but could not do it justice and at that point nothing else I could think of made me happy. Also, the stitchers before me on this block were some of the best around and they were a very hard act to follow. I dithered for quite a long time before finally realizing I had to get on with it and get the block moving again. I didn't do as much on the block as I would have liked and it isn't as good as I would have liked - but at least the block is on its way again, heading to Jo in NZ, who I know will pull it all together and finish it beautifully! So, the first thing I did was to add the silkie of the little girl with her apron full of flowers. She looked to me like she could be part of the May Day celebrations. 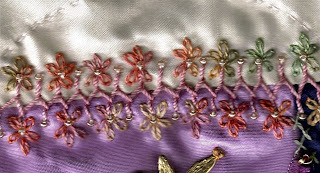 I used french knots in silk perle to accent the flowers in the print and edged the whole thing with a simple tatted edging. Next thing I did was a simple seam in the corner of a double row of herringbone stitches, added some straight stitches and some beads. Lastly I added a bit of lace to the corner which seemed to fit in there. 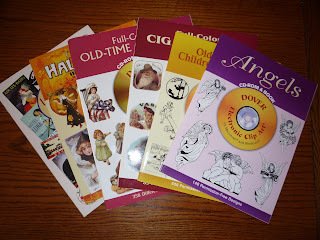 Here is another portion of my finds from my "treasure hunt" at the thrift store last week. Aren't they adorable? I just love them! They show some signs of wear, which is to be expected, but are really well made. I'm not sure what I'll do with them but wanted to share my find. Well, it's Sunday again so here is the framework for Week 5's seam. Like Week 1, it is semicircles but this time they are offset against each other. I think this will be another good one - lots of room to explore here! Excuse the irregularities in the stitching - did this in the car today while travelling. Have fun with this - I'm looking forward to seeing what you come up with! 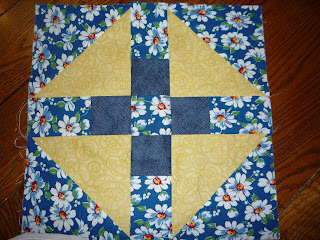 The Mailblocks group on Yahoo has monthly quilt block lotteries. Everyone makes 5 or so blocks in a specified pattern and colours and then a name is drawn from everyone who made blocks and they are all sent to the lucky winner. I resolved not to put my name in any month until I had the blocks completed. Don't need any more unfinished projects hanging over my head! So, for October the pattern chosen was Jacob's Ladder and the colours are blue and cream. I have just finished my blocks so can now allow myself to run over and put my name in the draw! This is all part and parcel of my wanting to learn to make "sane" quilts. Each month I take part gives me a bit more practice on making blocks. I am quite pleased with how these turned out - they are more complicated than I would have chosen so were a challenge. I am pleased though that I managed to match most of the points - I'm starting to see an improvement! I came across several items I couldn't resist at the thrift store yesterday. The first one was this dish towel. I picked it up simply because it felt wonderful - like it had dried a lifetime of dishes and could easily dry enough for my lifetime as well. 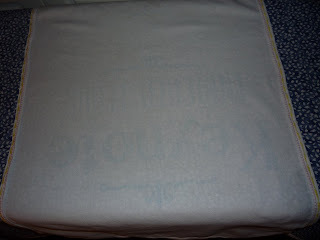 I was also charmed by the care that had been taken with the embroidered edge - that someone would take the trouble with a plain white dish towel. It wasn't until I washed the towel and was pressing it that I got a surprise. I'm not sure if you can see it because obviously great care was taken to bleach it out but if you look carefully you can see the words, "Keynote Enriched Flour". 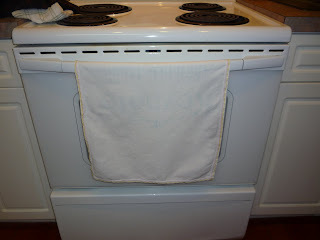 My lovely little dish towel started it's life as a flour sack! How cool is that? So, here it is in it's place of honour. No one else will notice this faded writing but I know it is there and it pleases me! I have other treasures from yesterday's thrift store treasure hunt and I will share them later. I can't believe I forgot to show this off until now! My excuse is that I started to use it immediately so it was off and away with me and my sewing basket at a workshop, a guild meeting, etc., being admired by everyone. I was even asked to teach a mini-workshop on how to make these - pretty good considering I didn't make it! So, who did? Lyn! 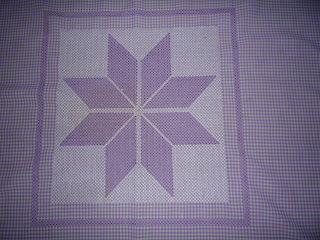 (http://quiltinglion.blogspot.com/ I was fortunate enough to win one of the giveaway contests on Lyn's blog and she sent me this wonderful pinkeep. I love it! I had never used one like this before but I immediately realized what a wonderful tool it is and started using it. 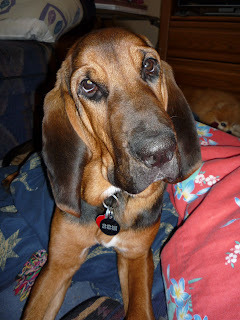 Now it is never far from my side when I'm stitching. Isn't it great when something is a useful tool and a work of art? 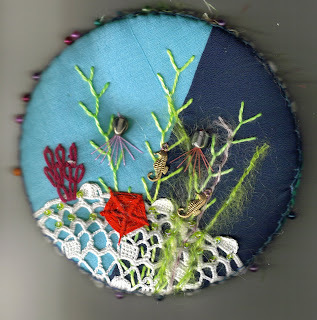 I really like the way Lyn used the doilies in these under the sea scenes! Look what arrived in my mailbox! I entered a giveaway on Jo's blog (http://www.nzjo.blogspot.com/) and due to a little good luck she sent me this beautiful olive coloured fabric postcard in the mail. Amazing to me to think that it travelled halfway around the world completed unprotected and arrived in perfect condition! I love it - thank you, Jo! 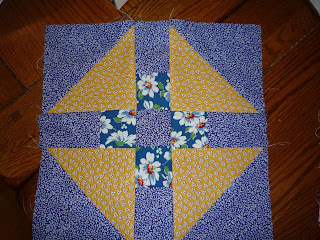 In my continuing desire to learn "sane" quilting, I have joined a Row by Row Round Robin on the Mailblocks Yahoo group. Everyone in the round robin does up a row of 5 - 12" quilt blocks in the colours and patterns of their choice and as they make the rounds each person adds another row. At the end of the round robin everyone will get back a fully pieced quilt top and only need to finish it off. Sounded like a plan to me! So this is my row which I have sent off to make the rounds. I included a cream batik in the package because I wanted all the background to be the same. I chose a 12" Maple Leaf pattern from the QuiltersCache site and requested the maple leafs to be done in batiks of colours which would occur in nature. Given the huge array of fall colours, as well as the greens, it shouldn't be too difficult to have each maple leaf different, or at least to have any duplicates well spread out over the quilt. I think it will be very pretty when it is done. I'm not sure what I will do with the finished quilt - whether I will keep it or give it to my in-laws as a gift. I think they would really like it as well. Now I am just waiting for the first row to arrive that I get to work on. I'm fairly excited about this - will post pics as they arrive and I work on them. Wendy is having a giveaway of a squishie to celebrate her 100th post. Congratulations Wendy! Here are my seams for this week. 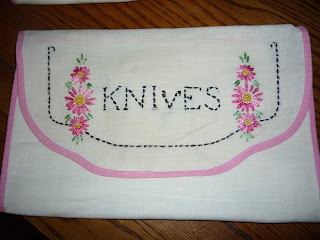 They are the seams I did on Bonnie's block in the Sampler Round Robin I'm in. This is the first one - using Chevron Stitch as a base I added french knots and detached chain stitch (lazy daisy). Here is the second seam treatment I did. This block had a wonderful green textured fabric with raised maple leaves so I decided to add these green maple leaf beads to one side of the chevron stitch. They are plastic but I really like them - they have a lovely shine to them. 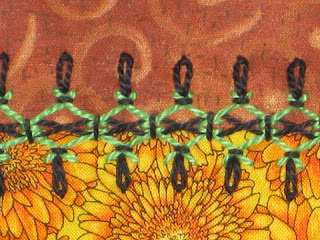 On the other side of the Chevron Stitch I added semi circles of straight stitches each one ending with a french knot. This is the portion of Bonnie's Block where I worked in this round robin. I did a couple of seams - neatly killing two birds with one stone since they were also my Build a Seam seam treatments for this week. I'll post close ups of them in the next post. This go around of this Sampler Round Robin the designated stitches were Chevron Stitch and French Knots so both are contained in the seam treatments I did. 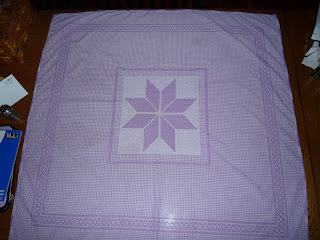 This was one of the two motifs that I did on Bonnie's block. It was a piece of reclaimed jewelry - a thrift store find of course, lol - and I used it as a cabachon. First I glued the cameo onto a piece of linen using that wonderful glue, E6000, and stitched around it twice with gold seed beads. 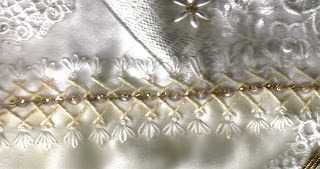 I then trimmed the backing fabric as close to the stitches as possible and added another round of beads. Then the whole thing was sewn onto the block. I like doing it like this because if the owner doesn't like it, just snipping a few threads will allow the whole thing to come off. I wouldn't feel right applying glue directly to someone's block - what if it didn't work? This is the second of the two motifs I did on this block. I made a topiary using french knots - hundred and thousands of french knots it seemed like! 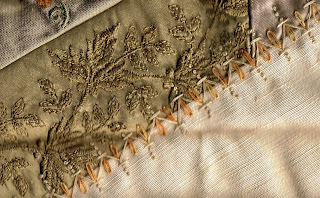 It was stitched with Weeks overdyed floss which gave it a bit of variety in the green. The plant pot is simply a plastic button sewn on. It can be removed easily if Bonnie prefers not to have plastic on her block and wants to replace it with something else. So, now I'm waiting for the next block to arrive in this round robin - I am really enjoying this one! Hope Bonnie likes what I have done here! 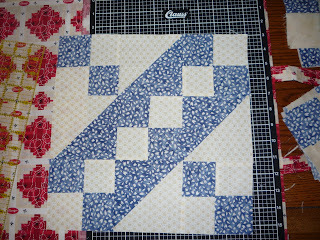 This is the second block I did for the breast cancer quilt Leslie is organizing. The picture is dark with lots of shadows but that makes it possible to see some details - difficult with white on white. In real life it is much lighter so once again a little imagination is necessary. As with the previous block, this one is made with wedding dresses. I used a lot of lace from the stash as well as some motifs from the wedding dresses and veils I picked up at the thrift store for this project. 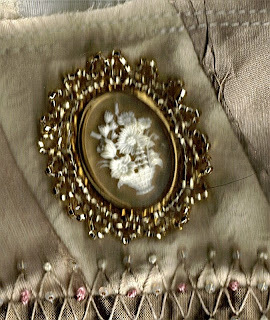 The little pearl heart on the bottom right hand corner came from the head dress of one of the veils that "came with". The huge sequined and glittered motif was the focal point at the waist of the most gorgeous wedding dress. If the hanging pearls are "too much", I've asked Leslie to just snip them off. All the other laces were from the stash. I love the little doves and added a gold charm for them to hold in their beaks. Not much else of note here - just added seam treatments and it was ready to go. I am making two blocks for a crazy quilt to benefit breast cancer. Leslie Ehrlich (http://pinyoncreek.blogspot.com/) organized us all and is putting the quilt together. The quilt is constructed all in white, cream and ecru - some touches of gold allowed as well as very pastel pinks and greens for SRE. The fabrics are all from wedding dresses! This is the first of my two blocks for the project. The theme is hearts so I have added a few here and there. 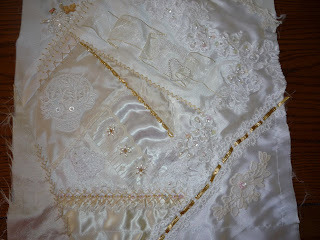 There is a lot of lace on this block as well as some beadwork, etc. The hardest parts were getting started and getting over the common aversion to white lace. Thursday is a good tv night so hopefully I'll get a chance to sit and stitch all evening and finish up the second block. This is what I came up with on the double herringbone framework for week 3. I added french knots and three detached chain stitch on the top and bottom spots. In the large middle spots I used a seed bead to attach a sequin. In the small spots in the middle I just used a seed bead. The sequins give it nice sparkle and I'm quite happy with it. 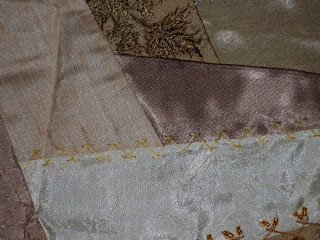 Here are some samples from Week 2 of Build a Seam (cretan stitch base). 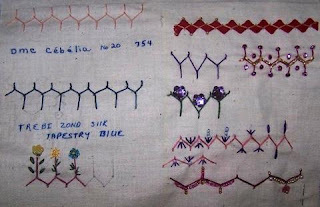 The sampler and the three seam samples are all the work of Kathy ( http://akinaustralia.wordpress.com/) - more inspiration! 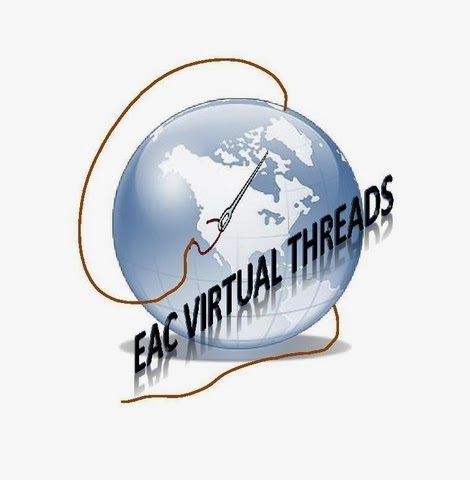 I think the beaded cretan stitch seams are very interesting. You can get really nice effects using beads to build a basic embroidery stitch but the results are always something different. I hope everyone is having fun with this week! This example of Rita's is not finished yet but she kindly allowed me to show off what she has done so far. 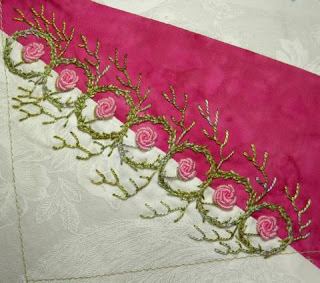 Rita has extended the use of the chain stitch to her additions in this very colourful seam. 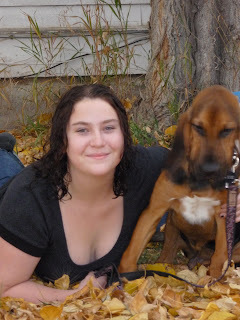 Gail (http://galynn-bhmc.blogspot.com/index.html) has provided another example of something I would not have thought of myself. 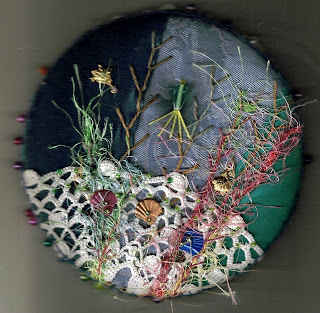 Don't you love seeing where other stitcher's imagination and creative process can take you? I do! Now I can't wait to see some samples from Week 2! 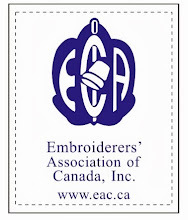 I had the pleasure last Saturday of attending a Stitch-In Day held by the Calgary Guild of Needle and Fibre Arts. These blocks are what I took with me to work on. They were for a quilt block lottery I took part in. Each month one of the online groups I belong to have a lottery where a block is chosen, in this case "Lover's Knot", along with specific colours. The colours chosen for this one were blue, yellow, white and a print with yellow centered flowers or any combination of these colours. So, these are the fabrics I chose and I managed to get my five blocks made. Your name goes into the hat if you pledge blocks and then one name is chosen and everyone sends their blocks to that person. She ends up with enough blocks for a quilt top usually. 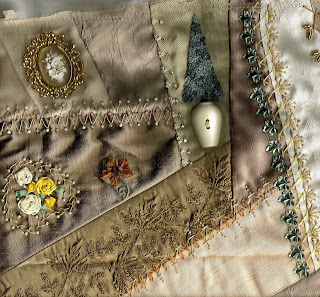 I have loved "sane quilting" as we cq'ers call it, forever - my Mom was a quilter and I still treasure the ones she made no matter how threadbare they are becoming. So, my motivation in taking part in these lotteries is to force myself to learn how to piece blocks so one day hopefully I will manage to make a quilt of my own. Of course, if I happened to win the lottery one month that would be an extra bonus! On our recent little holiday to Trail in British Columbia we made a stop at the Market in Nelson, B.C. I love this market and can just imagine spending my summer Saturdays hanging out there selling little crazy quilted items! 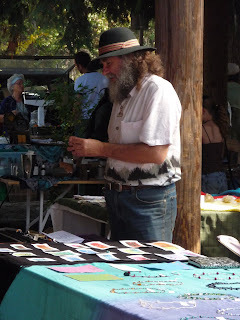 The Market seems to be a mecca for the arts and crafts crowd and I always find myself thinking, "Oh, so this is where all the hippies went!" 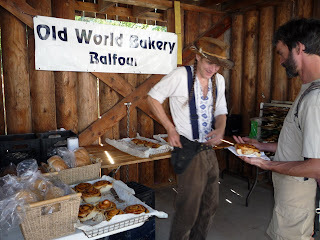 lol There is an abundance of wonderful baking like the enormous cinnamon buns this fellow with the Mel Gibson blue eyes was selling. 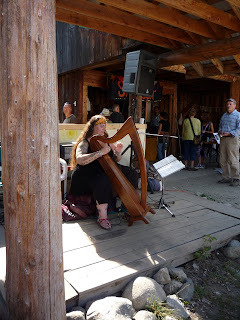 There was live entertainment on the day we visited, provided by this lady with the harp. I so seldom hear the harp - I don't suppose any of us do! - but it is such a beautiful instrument whenever I hear it I wonder why it isn't around more. I always find something to buy at the market - not counting the cinnamon buns which are a given. 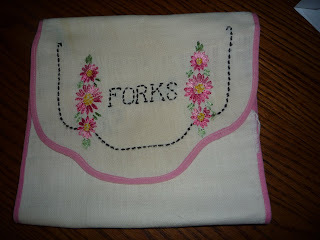 There are vintage textiles: doilies, aprons, etc. 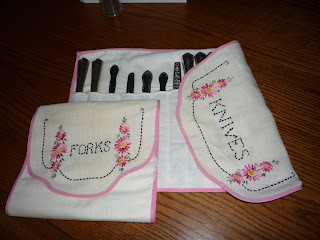 I am always on the lookout for another chickenscratch apron or tablecloth to add to my growing collection or some cutter doilies for the crazy quilting. You can buy canning, crystals, jewelry, etc. On this visit I found some wonderful dulse, very fresh and delicious. Not an easy thing to find on the landlocked prairie where I live. If you don't know, dulse is a lovely purple seaweed which is harvested in the Maritime provinces. When I was a child we bought bags of it in the corner stores where it sat happily between the bags of chips and things like that. Not only is it delicious but it is the highest form of protein found in a plant that is still digestible. So, if you are ever in Nelson in the summer - check out the Market. You'll love it! The colour in these pictures is awful - my apologies! Anyway, this is the pinkeep that I made for the swap at CQI. There have been such lovely ones made for the swap so I can't wait to see which one I get! This is my seam for week 2 of Build a Seam. 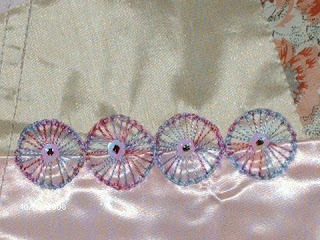 I used a variegated perle to make five petaled flowers on alternate spokes of the cretan stitch using detached chain stitch (lazy daisy stitch). Then I added beads to the remaining spokes as well as the centers of the flowers. It is not terribly imaginative or novel, but I like it!